60.46% of people buy Melissa & Doug: Water WOW! 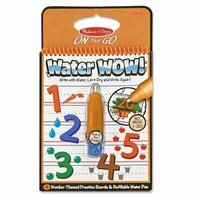 Numbers and Melissa & Doug: Water WOW! Alphabet. "Played with over and over"
Great learning toy. Used over and over. Easy to use. Our children loved how quick it was to do. Good little gift too. This is a very clever concept and really popular with3–7 year olds. No mess and it kept them happy for hours. 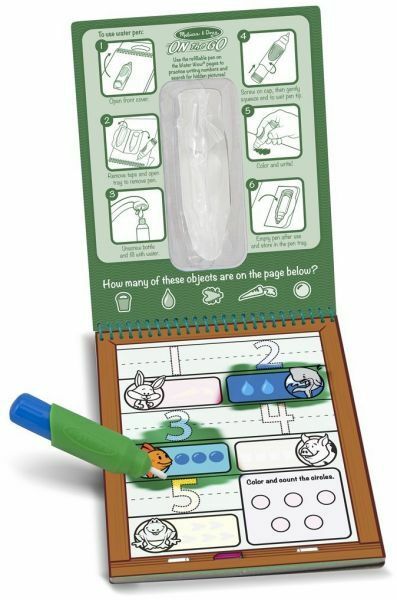 This exciting activity book includes four reusable pages and a refillable water pen. Use the pen to fill in each activity, from colouring in counters to tracing numbers, and see hidden colours and pictures appear with every stroke! Then simply let the page dry to erase the pictures and fill it in again and again. This learn-to-count book includes numbers 1–20 to trace, alongside pictures of familiar objects to count. There are empty lines to practice writing the numerals, too! The chunky-sized water pen is easy for kids to hold and stores neatly right in the front cover.